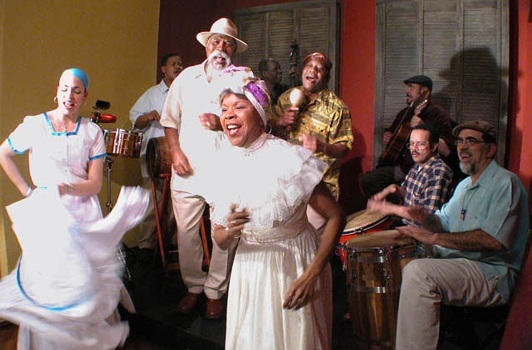 Afro-Caribbean music, as it developed into different styles in Cuba, Haiti, the Dominican Republic and Puerto Rico, has at least two things in common, rhythm and dance. There is no way you can listen to it without moving your body. New forms of Latin music, like salsa and raggaeton, have taken over the dance floor in clubs, but the traditional music continues to be practiced not only on the islands, but also in the United States, wherever immigrants settled. For Puerto Ricans, that was the South Bronx and East Harlem, the barrios of New York City and the neighborhoods from which Los Pleneros de la 21 hail. First, a vocabulary lesson: “Los Pleneros” means the people who play the “plena,” a traditional Puerto Rican musical form. “De la 21” refers to the No. 21 bus stop in Santurce, the municipality of San Juan where lots of the plena musicians lived. The New York-based group, established in 1983, plays the folkloric plena, but also the bomba, another famous musical form from the island. More vocabulary words: barriles are tall, barrel-shaped drums made with goatskin drum-heads, integral to the sound of bomba. Other instruments include maracas, the rattle made from gourds, and the cuá, sticks of wood which make their own rhythmic sound when struck against the side of the drums. The plena, a call-and-response form featuring songs that poke fun at the politics of Puerto Rico (and Puerto Rican New York) features the drums called pandaretas, which are hand-held frame drums, also made with goatskin heads. “It was the summer of ’83,” he said. “I was so enthusiastic that I went to everyone—all the social clubs in the community. There were a lot of events during the summer. I even went to student groups. … We were rehearsing for our first gig, at a social club on the Upper West Side that was managed by a guy from the same town in Puerto Rico where my musicians were from. The word started to go out and soon, more and more old-timers starting showing up. They hung out with us, played a little. It became a big reunion. One of the guys said, ‘we should call the group the Pleneros de la 21 for the bus stop in our barrio.’ The name stuck. “We started as a performing group, but we became a community group because the community needed us,” he said. “People would show up and say, ‘You have kids classes, right?’ So we started offering them. Today, part of the Puerto Rican Music Project, funded in part by the city, state, and the National Endowment for the Arts, Los Pleneros offers a range of cultural programs including drumming and dance workshops for children and adults, lecture demonstrations at city schools, and college tours, offering concerts and master classes, as well as the cultural education that this exposure to traditional music of Puerto Rico, and the narrative that goes along with it, can offer. “We dance, sing, drum, jump, scream, yell, compose verse, create new music, experiment for our public performances whether they be concerts or dances or workshops. We do not just perform the Bomba and Plena, we LIVE IT! We bring with us to work from our homes and take right back again. We bring it to the coffee shop, supermarket, school house, auditorium, dance hall, stage—La Bomba y Plena is what we do,” states the group’s website. Indeed, the latest release from the Miguel Zenón Quintet is called, “Esta Plena.” The group has shared the bill with Los Pleneros on tour and includes music from this new release, which is “a bridge between elements of ‘Jazz Music’ and ‘Plena Music’ from Puerto Rico,” according to the group’s website. The recording received two Grammy nominations in 2009. The Pleneros also received a Grammy nomination for Best Traditional World Music Album in 2005 for their Smithsonian Folkways Recording, “Para Todos Ustedes”. The list of “old-timers”, the original members of Los Pleneros, includes many who have since passed away. Marcial Reyes was one of the founders, and Edgardo Miranda was an influential guitarist in the group. Gutiérrez calls them “The Masters.” These “Masters” are also memorialized on Los Pleneros’ MySpace page. “All those musicians, dancers and key community members who fought to maintain and to enforce the importance of practicing and remembering our traditions… we can never know who we are if we don’t honor or remember those that came before us and that paved our paths.” Part of the tradition of Los Pleneros is to honor these musical forbears with a ritual of remembrance every year, a big party with singing and dancing. “We do for them exactly what it is that we do best. And we enjoy it,” Gutiérrez said.